Product Catalogs - Loos & Co., Inc. 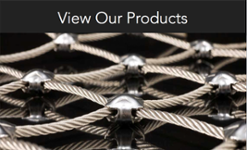 Your one-stop shop for all things wire and cable related. Includes a complete listing of Loos & Company's standard manufactured products - but remember, we're a manufacturer and produce custom products to fit your needs. Many of these products are in the industry specific catalogs below. Click the link below to download. In case you don't need the entire Loos & Company Encyclopedia in your hands at all times (although, we do recommend it). When only a quick reference is required, our condensed version is the way to go. Click the link below to download. The Cableware® Division of Loos & Co., Inc. is the premier QPL manufacturer of terminations, connectors, and fittings for wire ropes and cables from 1/16” to 1/2” in diameter. Specializing in Military Specification (MS), AN and NAS parts, the Division’s stainless steel hardware has earned the reputation of being the finest quality in the industry. The division also offers a full line of sleeves and stops, thimbles, clips and pins to meet the needs of various industries. Click the link below to download. Loos & Company's condensed Wire Division catalog is a great reference guide for all things wire. Click the link below to download. Cable assemblies are a critical element in both the highly specialized aircraft industry and on mission critical military applications. Because of our experience and proven attention to the highest level of quality assurance, we supply nearly all major military and commercial aircraft manufacturers. Learn more about our aircraft control assemblies with this brochure by clicking the link below or visiting our product page. Loos & Company's Medical Technologies Division produces wire and cable solutions to support medical device manufacturers. This is a quick reference guide to everything you need to know about medical wire and strand from material selection through to packaging and labeling. Click the link below to download the catalog. All of the important technical information in our condensed catalog, converted to the metric system! Click on the link below to download the metric edition. For more than a decade, the world’s leading fitness equipment manufacturers have relied on Loos & Company cable as the only cable used in their equipment. Developed in our research and manufacturing facility, EXERFLEXPRO builds on Loos & Company's tradition of providing fitness equipment manufacturers, equipment owners, and equipment repair professionals the highest level of cable performance and safety on the market. To learn more, click below to download the brochure. 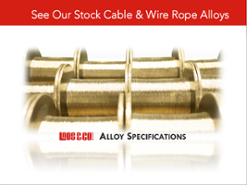 Loos & Company provides the highest quality cable and wire rope for a wide range of marine applications. Wire for wire, strand for strand, you can depend on Loos when only the strongest, high performance rigging will do. Click the link below to download the Guide. Loos & Company wants to make sure that the only down time your line sees is when you want it. Our attention to the proper cable construction and exclusive Lolonsup>® coatings provide the best can conveyor cable available. Call your conveyor cable supplier and ask for only Loos & Company Canveyor® Cable. Click the link below to download the brochure. 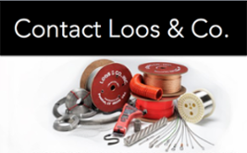 Loos & Company is proud to offer a wide variety of military specification and commercial pulleys and sheaves. These products are the perfect compliment to the specialized wire and wire ropes used in markets that we've supported for years. Pairing your Loos & Company wire with the highest quality pulleys and sheaves will repay you with the performance you have come to expect from our products.